Shakespeare, a 5 year-old Aussie who has earned his Canine Good Citizen certificate and is a Pet Partner therapy dog. Juliet, a 2-1/2 year-old Aussie who competes in Frisbee and is learning agility. Both born deaf. Other pets: Ophelia — Fee for short — a 3 year-old Border Collie who competes in Frisbee; Scartlet, a 12 year-old kitty who loves Shakespeare. 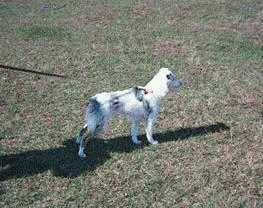 Deaf dog: Woofer, a four-year-old double blue merle Catahoula, born deaf. Other Pets: Buddy, a 8-year-old Lab; Roo, a 3-year-old Aussie; Jazz, an 11-year-old Quarter Horse; Nero, a 14-year-old Paint Horse; Mello Yellow, a 10 foot Yellow Burmese Python. Deaf dog: Glue is a 2 year old Dalmatian. I've only had Glue a few days and he is very well behaved, active and affectionate. Other pets: Tina, a hearing Dalmatian. Deaf dog: Ebony, a 10 year old congenitally deaf Chinese Crested, is a certified therapy dog through TDI. 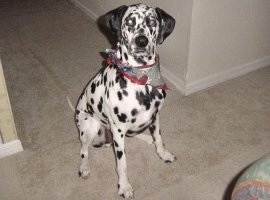 Deaf dog: Dexter, a 3 year old Dalmatian, was a rescue dog. "He came to our home originally as a foster and a foster only but stole our hearts. He will always be with us now. We could never part with him. He has taught us so much. When Dexter first came to our home we had no idea he was deaf. It took us about a week to realize something just wasn't there with him and we finally realized he could not hear." Dexter shares a website with Hali. 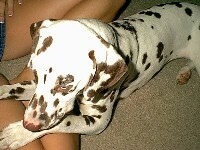 Other pets: Hali, a female Dalmatian and 3 male cats. 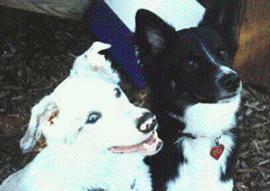 Deaf dog: Sundown is a 1 year old Australian Shepherd. "We adopted "Sunny" from ARPH and he is truly a sweetheart. We picked him because we felt it he might have a hard time being adopted. We have another Aussie and love the breed. We were told when we got him that when happy he would wag all over. An understatement. He's an average teenager, hungry all the time, loves to play tug, and loves to irritate his new sister who is 9 years old." Human companions: Jan Strickland and her husband Ron. Other pets: 9 yrs old female Aussie, Brownie, 9 year old female Aussie and Wild Thing, 15 year old mixed breed cat. 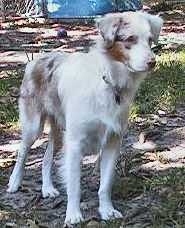 Deaf dog: Jake is a 7 month old Australian Shepherd. "Special Agent 007 "Jake" is a very loving dog with the most beautiful blue eyes. He loves attention and in return gives more love back to you than you would expect. I adopted Jake from the New Leash on Life rescue. Jake saw me and waited for me to come to him and pet him, and when I did he, put his head on my shoulder and his paw on my hand and just looked at me as if to say, 'Well, partner, am I going home with you or what?' No matter where I go Jake is there with me and sleeps close to me at night.A very friendly and gentle dog, Jake is also very smart and a fast learner. Jake likes to sit on the float in our pool and enjoy the scenery. He also enjoys eating coconut, and playing tug-of-war with our German Shepherd. Jake is the sweetest and most wonderful dog." Human companions: Sahar Rice, her husband John, and son Nick. Other pets: Arrow, a German Shepherd. 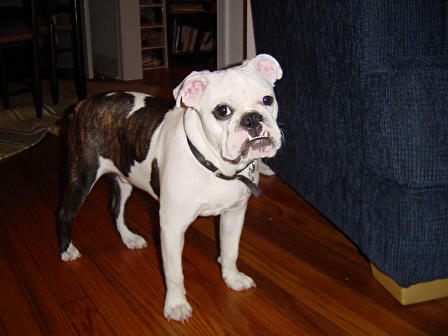 Deaf dog: Tubby's owner writes: "Tubby is a 1 year old miniature English Bulldog that was born deaf. Being deaf doesn't slow him down any. He has a great personality and knows over 15 hand signal and tricks. He loves other dogs, going to the beach and his parents spoiling him rotten. " Deaf dog: CeCe was up for euthanazia at the local shelter because she was "unadoptable". I got an e-mail from rescue looking for a foster home for her and she never left. What a wonderful "unadoptable" dog she is! Deaf dog: Muffin the Intrepid is a great example of the genetic disasters that can result from puppy mills. We rescued at 18mos. nearly dead of skin infection. He's survived life-long skin problems, raging bacterial infections that required the amputation of first one, then both of his ears (called "ear ablation"), and now he's a cancer survivor. 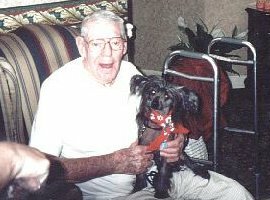 Muffin has his Canine Good Citizen and is a certified Pet-Assisted Therapy Dog. He's learned to respond to about 36 signs so far (some ASL, some home-made). But he just doesn't ever give up. He's been deaf not quite 2 years -- it's different than a dog born deaf (not better or worse -- just 'different' because he HAD hearing and now is stone deaf). He has a huge affinity for children. Comment: I tend to rescue "special needs" dogs -- I have rheumatoid arthrtis myself, asthma and severe dermatitis and the dogs I help tend to have one of those problems (at least). I took Muffin because of his skin problems, and he earned the name "The Intrepid" simply because he's THE bravest animal I've ever known. 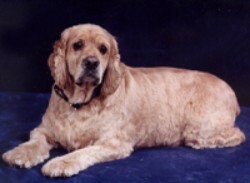 He is truly "Muffin the Intrepid English Cocker Spaniel"
Deaf dog: "My family and I just brought Cappuccino home from the local humane society and did not know at that time she was deaf. Now we know and we love her that much more. She is very affectionate and playful and has been great with our two small children. It has not been any different than raising a hearing dog, except that she doesn't come when called. No big deal...we go to her! "